The JERZEES – Youth Heavyweight Blend 50/50 Cotton/Poly T-Shirt Style 29B is available in Youth Sizes: XS(2-4) S(6-8) M(10-12) L(14-16) XL(18-20) and comes in a variety of colors to compliment your wardrobe! 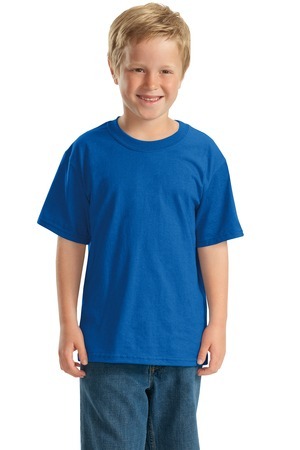 This Youth Heavyweight Blend 50/50 Cotton/Poly T-Shirt is made from 5.6-ounce 50/50 cotton/poly, oxford is 47/53 cotton/poly, 1×1 rib knit crew collar, seamless body with set-in sleeves, double-needle coverstitched on front neck, shoulder-to-shoulder taping, double-needle sleeves and hem. Be the first to review “JERZEES – Youth Heavyweight Blend 50/50 Cotton/Poly T-Shirt Style 29B” Click here to cancel reply.